is divided into two main categories: normal and racing with police. The first is similar to many other games of the genre. The second difference is in the way: if you are caught by police while committing an offense, there is a pursuit initiated in the style of American action movies. Depending on the severity and duration of the violation, multiple cars entering the Chase, and create roadblocks to call a helicopter to drop bombs on the poor offender! The game brings a respectable library of 40 cars that were digitized with precision (Aston Martin, Ferrari 550 Barchetta, Lamborghini Murcielago, Lotus Elise and Mercedes Benz CLK GTR are some of the highlights). But the similarities with "Gran Turismo 3? end here. Unlike the popular simulator, which stands for realism in "NFS: HP2? 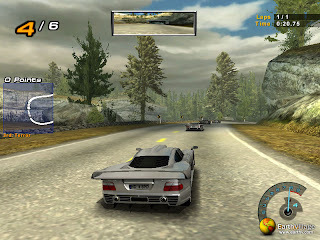 cars are impossible curves and give giant leaps (highlighted by a Matrix effect triggered automatically, which freezes time and rotate the camera with a blur). But this should not be seen as a negative point, since the whole structure of the game is based on running dangerously. The songs were removed to reduce the size.